Description: This electronic publication is a professional quality DVD video of an in-depth, technical interview with Jose Paris, Exterior Designer, Industrial Designer, Ford Motor Company, USA. We are focusing on the industrial design, exterior and interior design, the integrated product / process / manufacturing / quality and safety design aspects of an exciting new concept car. Four wheel traction control; Center differential control; Electronic rear-break pressure control using ECU controlled valves; Rear leveling system using electronically driven pneumatic pumps; Automatic detection and vehicle load monitoring; Active electronic cornering enhancement, and body roll-over control (... continued in Part 2). The description and explanation of the hydraulic circuit of the ACE system; The use of accelerometers to detect numerous operating conditions to adjust the behavior of the vehicle; The ACE system software development team approach, and the way mechanical, electronic and software engineers work together in a team; Vehicle mechanical and electronic diagnostic solutions using software tools. Description: This electronic publication is a professional quality DVD video presentation by Paul Silver, Manager, IBM PLM Solutions, and Gary Carne, Technical Support Engineer, IBM, USA, focusing on the key elements, and the benefits of Digital Mocup (DMU) within Dassault Systemes' PLM (Product Lifecycle Management) set of methods and software tools. The presentation includes several advanced digital product review, assembly, process planning and simulation use cases from the automotive industry, nevertheless the principles presented apply to literally any industry. 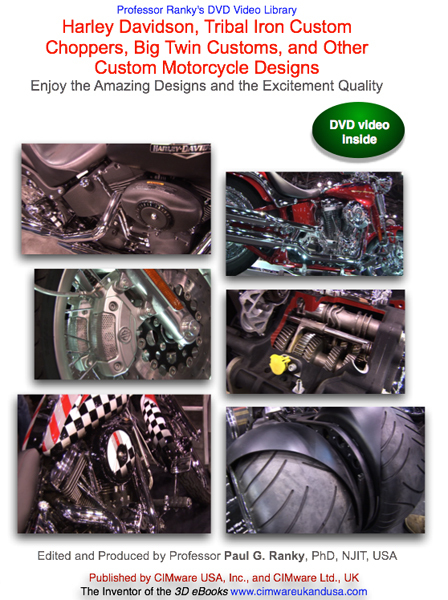 Description: This publication is a professional quality DVD video, illustrating Big Twin Customs, Swift Motorcycle Co., S&S, Country Line Choppers, Lonesome Road Choppers, and other custom motorcycle designs. The beautiful wide-angle, and close-up shots in this video illustrate the key artistic and engineering design / industrial design / product and process quality concepts of achieving often amazing products, exciting the customer and creating motorbikes, that customers want and desire. Description: This publication is a professional quality DVD video, illustrating Harley Davidson,Tribal Iron Custom Choppers, Big Twin Customs, and other custom motorcycle designs. Description: This publication is a professional quality DVD video, illustrating Suzuki, Honda, Pastrane Airbrush Studios, S&S, Lonesome Road Choppers, Sportbike Customs, BMW Oldies, Moto Guzzi, Bourget's Bike Works, Super, and other custom motorcycle designs. 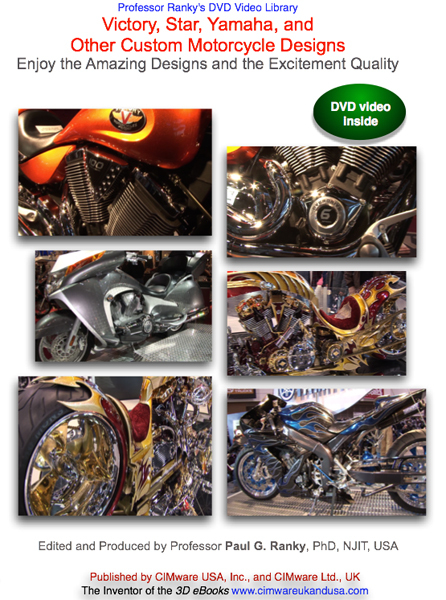 Description: This is a professional quality DVD video, illustrating Victory, Star, Yamaha, and other custom motorcycle designs. The beautiful wide-angle, and close-up shots in this video illustrate the key artistic and engineering design concepts of achieving often amazing products, exciting the customer and creating motorbikes, that customers want and desire.